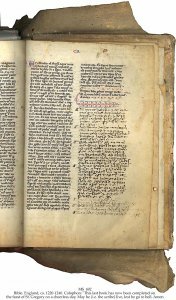 Description	 MS in Latin on vellum, England, ca. 1220-1240, 520 ff. (complete), 24x17 cm, 2 columns, (17x11 cm), 49 lines in a skilled, clear rotunda Gothic book script of medium quality, 14th c. notes, headings in red, large, 2-to 4-line, decorated initials throughout in red and blue with extensive and unusually varied pen flourishes, by a skilled and sometimes quite exuberant artist. Binding	 England, ca. 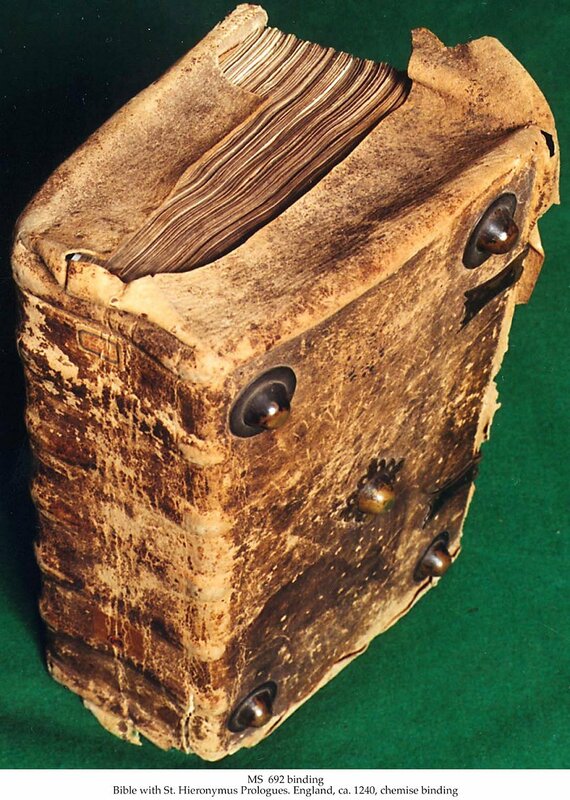 1240, deerskin over stout beech boards, sewn on 5 split tawed thongs, made as a chemise binding with the leather extending well beyond the covers to practically encase the volume. Complete on top edges including the tab on top of the spine, only a small portion remains along the lower edge, the 2 catches on the upper cover are preserved. 10 brass bosses, 5 on each cover, probably 15th c.
Provenance	 1. 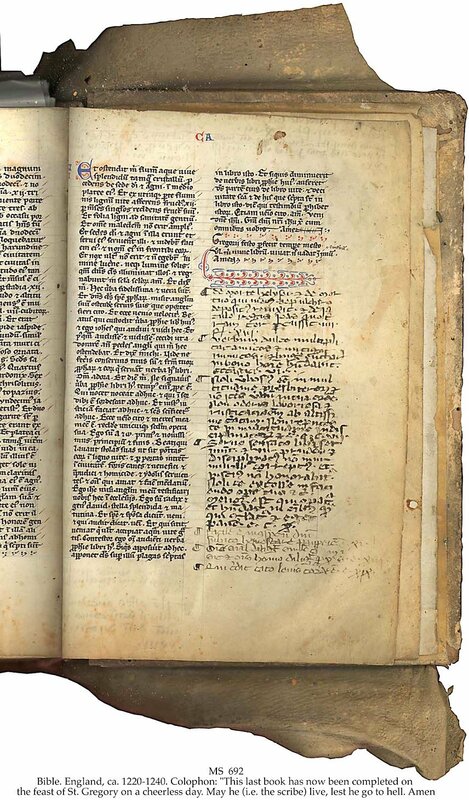 English owners (marginal annotations 13th & 14th c.); 2. Convent, Köln (1586); 3. Possibly: Visconti, Milano (1752); 4. Possibly: Richard Heber, Oxford, London (1773-1833? ); 5. Earl of Ellesmere, Bridgewater Library, London (1833?-1897); 6. Quaritch, London (1898); 7. Possibly: Michael Tomkinson, London (until 1922); 8. Quaritch London (1922?-1926); 9. Possibly: Sir John Cockerell (from 1926); 10. Maggs or Quaritch, London (1950-ies); 11. Frank de Bellis, San Francisco (1950-ies - 1989); 12. Mrs. Serena de Bellis, San Francisco (1989-1990); 13. Bernard Rosenthal, San Francisco. Commentary	 Colophon: "Gregori festo perfecit tempore mesto ultimum nunc librum. Vivat ne vadat in imum (infernum). Amen". i.e. : This last book has now been completed on the feast of St. Gregory on a cheerless day. May he (i.e. the scribe) live, lest he go to hell. Amen. Chemise bindings are very rare, for another one see MS 673. Exhibited	 Conference of European National Librarians, Oslo. Sept.ember 1994. See also	 MS 673 Missal with trimmed chemise binding, England, 1405-1410.